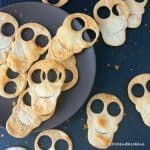 Plain and simple baked spooky skull tortilla chips with bloody salsa makes a perfect Halloween snack or appetizer for parties! 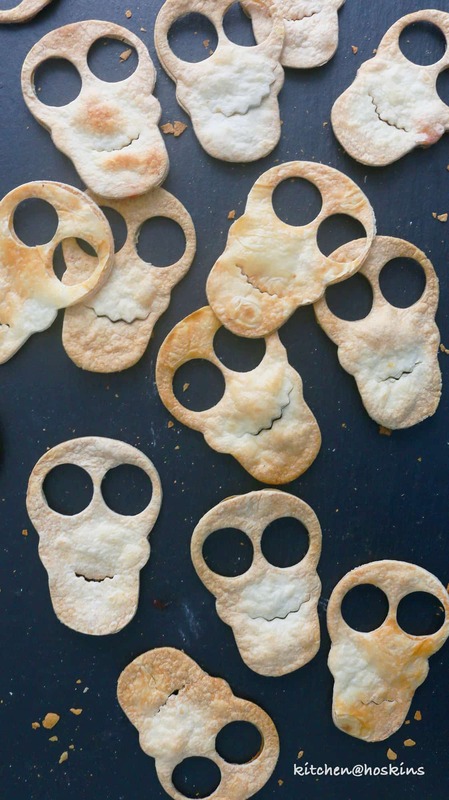 How spooky are these crispy, crunchy skulls?? Ok, that sounds creepy! But, really?? 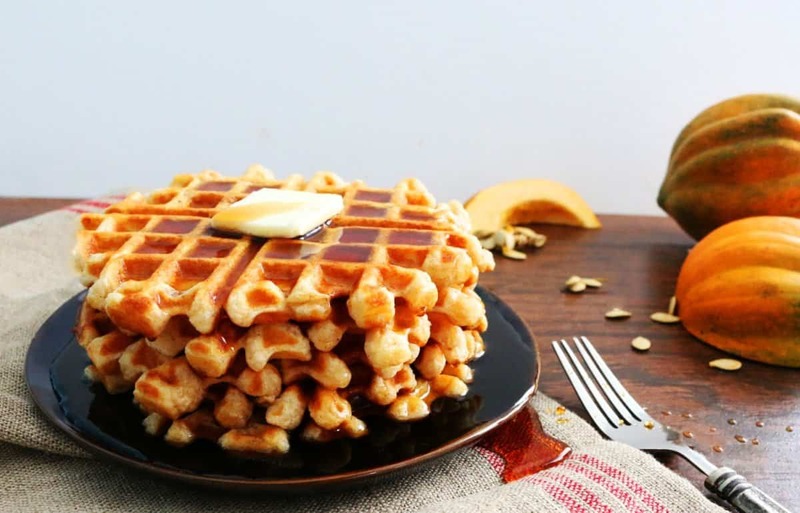 I couldn’t contain my excitement when I was experimenting with these and so did my kids. Kids of all ages will be impressed! 3/4-inch round cutter ( I used the back of a Wilton 2A round piping tip). You will need the size of eyes to be proportionate to the skull face. So, anything you have around the house will work. 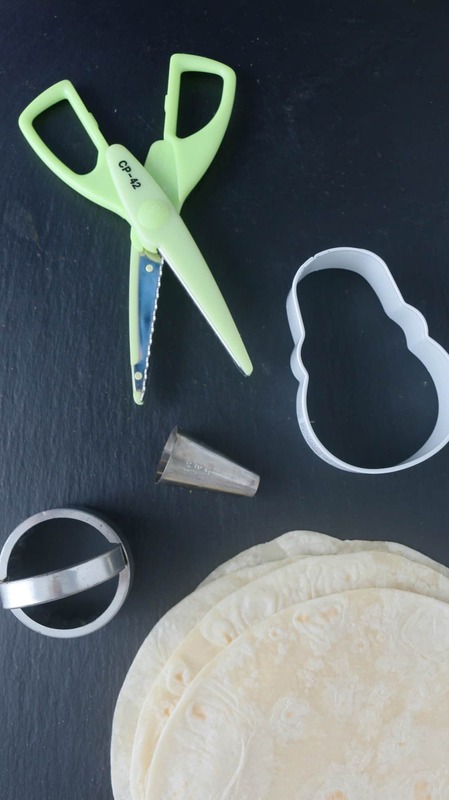 1 3/4 – inch round fluted cookie cutter or a scalloped edged scissors. 1. 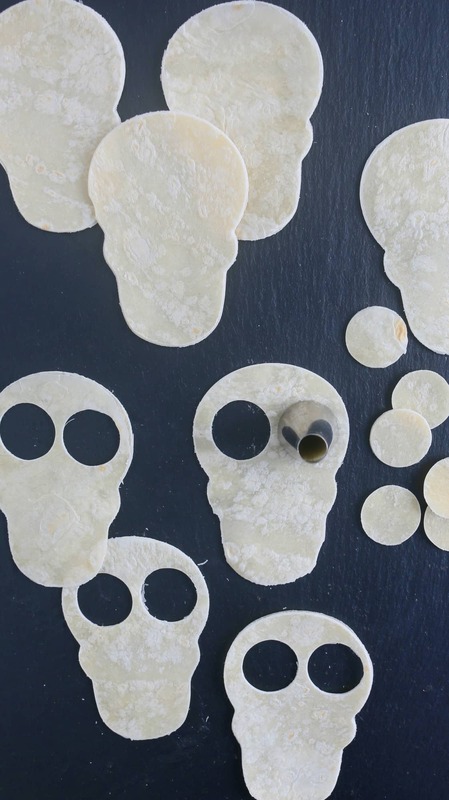 Cut skull shapes from tortillas. 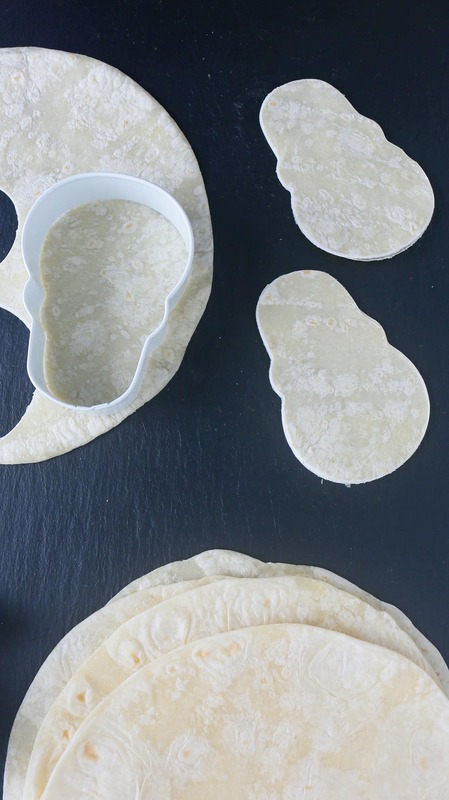 I was able to cut 4 skulls from each 7-inch tortilla. 2. Punch holes for eyes (I used the back of a Wilton 2A round piping tip). You will need the size of eyes to be proportionate to the skull face. So, anything you have around the house will work. 3. 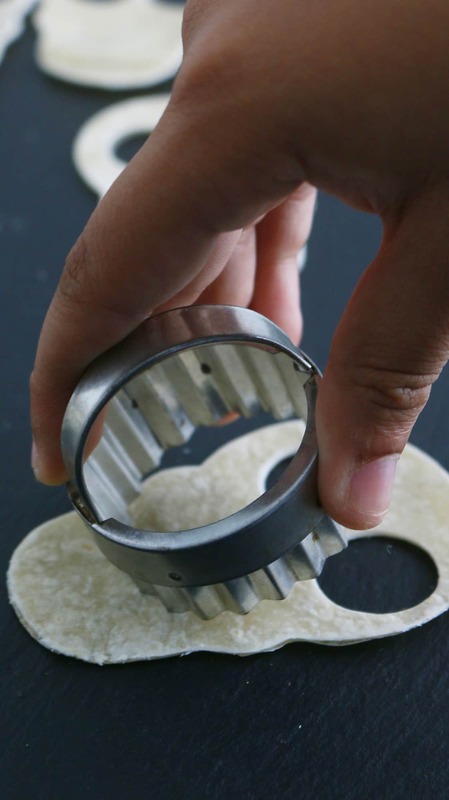 Mouth can be cut two possible ways – Using a fluted round 1 3/4 inch cookie cutter or a scalloped edged scissors ( You can easily find both at Michaels / Joann / Amazon). 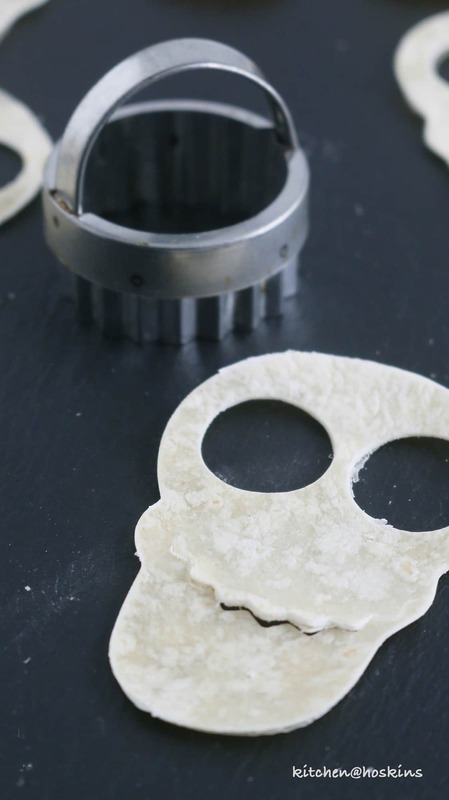 If using a fluted cookie cutter ( My preferred method <— makes a lovely smily faced skull ) – As shown in the picture below, press and cut only one side of the cookie cutter on the lower portion of face without going through the edges. A bit tricky, but you will get the hang of it. 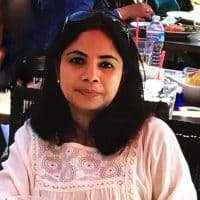 If using a scalloped edged scissors – As shown in the picture below, fold the lower mouth portion of skull and cut in an angle going upwards towards the edges (to make a smily face) without going through the edges. 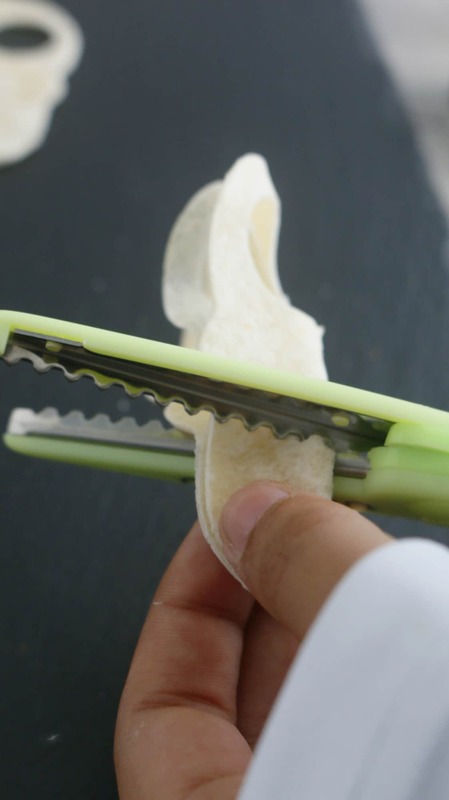 If you don’t have both then use a plain scissors or a knife to cut slits for mouth. I loved the ridges <— more realistic and creepy. 4. 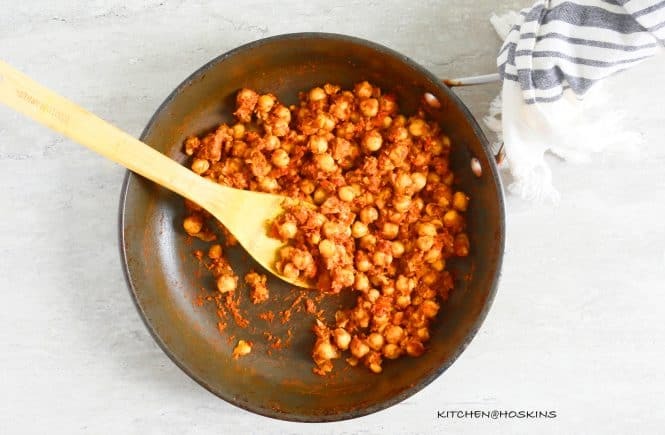 Place in a baking sheet, spray a thin coating of non-stick cooking spray and bake at 350 degrees F, until golden brown. 5. Serve with salsa with a dash of red food color stirred in it. More bloody like! Why are you gonna love these edible skulls? 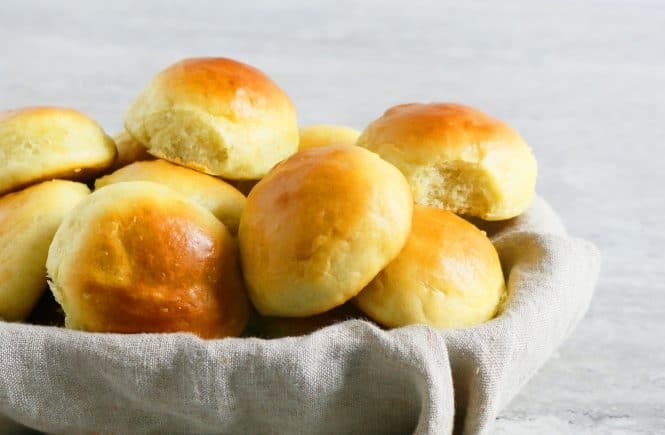 Simple recipe. More of an idea! 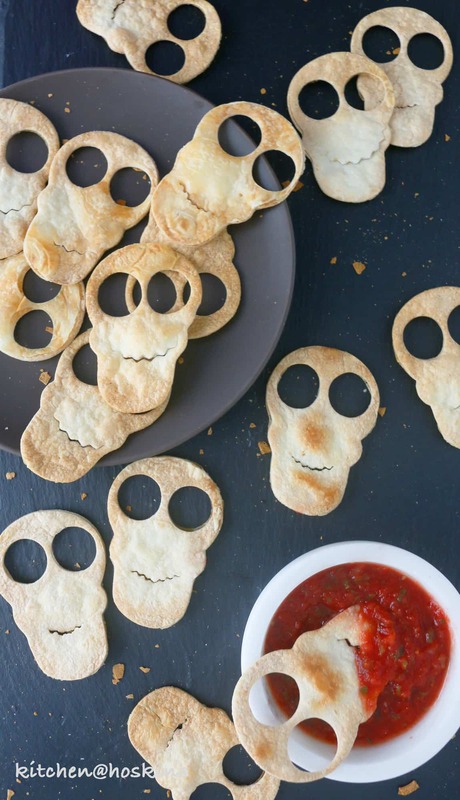 Baked spooky skull tortilla chips with salsa makes a great Halloween snack! Preheat oven to 350 degrees and spray a baking sheet with non-stick spray and set aside. 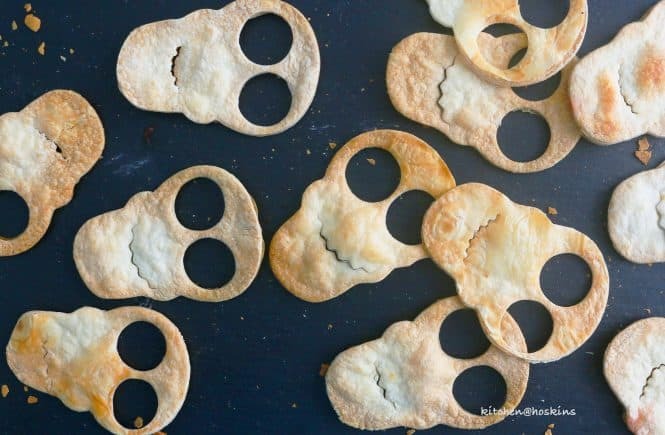 Cut skull shapes from tortillas (I was able to cut 4 skulls from each 7-inch tortilla, but this depend on the size of your cookie cutter). Using the back end of the piping tip or any round cutter, make two holes for eyes. If using the fluted round cookie cutter (my preferred method), press and cut only one side of the cookie cutter on the lower portion of face without going through the edges. A bit tricky, but you will get the hang of it (refer picture above). If using the scalloped edge scissors, fold the lower mouth portion of skull and cut in an angle going upwards towards the edges (to make a smily face) without going through the edges (refer picture above). 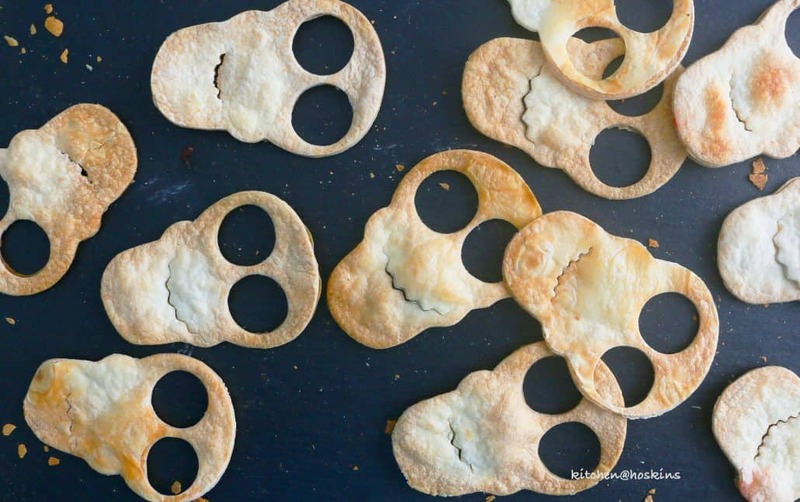 Place all skull shapes in a single layer in the prepared baking sheet. Spray a thin coating of non-stick cooking spray. Sprinkle salt if preferred. Bake for 14-18 minutes, until golden brown, rotating pan halfway in between. Place pan on a wire rack to cool completely. 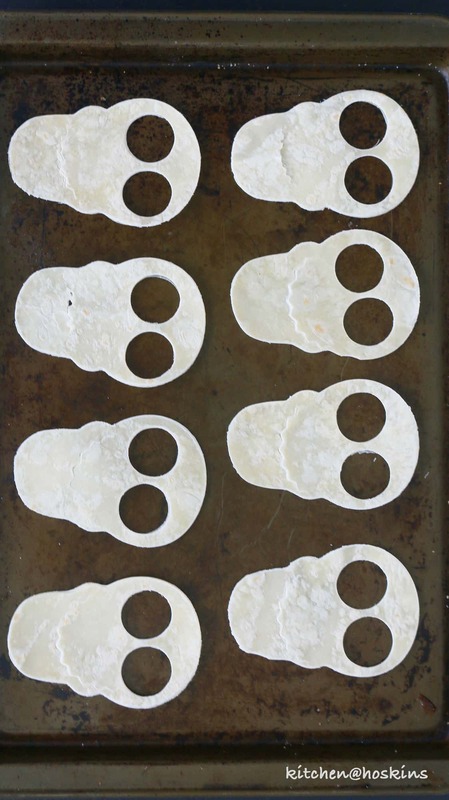 Spooky tortilla skull chips can be made up a day or two ahead and stored in a air tight container. Those are adorably ‘creepy’ cute!! I love skulls! Definitely would be so much fun at any Halloween party and I could see everyone going back for more!